The Carolina parakeet was a common species living in old growth bottomland forests until Europeans settled eastern North America. Overhunting and deforestation doomed this only temperate species of parakeet. The colorful noisy birds were an agricultural pest that destroyed ripening fruit when they fed upon the seeds inside the pulp. Orchardists wiped out entire flocks. Though parakeets are supposed to be intelligent, they were not well adapted to avoiding patient men with guns. A farmer firing his weapon into a flock (the birds routinely congregated in flocks of 200-300) caused the survivors to fly in a wide circle and return to the same place where their feathered comrades had just been killed. A farmer could slaughter the entire flock in an afternoon without moving from the same spot. Carolina parakeets nested in large hollow trees, but lumbering operations during the late 19th century eliminated their homes as well. The last population of Carolina parakeets was probably rubbed out by market hunters seeking red and green and yellow feathers, then fashionable in women’s hats. The last wild specimen was taken near Lake Okeechobee, Florida in 1904, and the last captive specimen died in the Cincinnati Zoo in 1918, coincidentally the same place and year where the last passenger pigeon died. Until recently, the only North American fossil remains of a parakeet was a specimen found in Nebraska, dating to the mid-Miocene (about 16 million years BP). Scientists are uncertain if this specimen represents a species ancestral to the Carolina parakeet, the same species, or a different lineage. In any case no fossil remains of a parakeet dating to the Pleistocene age (~2 million years BP-11,000 years BP) had ever been found in North America. Carolina parakeets lived in habitat where preservational processes don’t often occur. Most bird remains are found in caves where they were carried by roosting owls or hawks. There aren’t many caves in the lowland habitats favored by parakeets. Moreover, the flesh of parakeets was toxic to many predators because they fed on poisonous cocklebur seeds. Their colorful plumage may have worked as a deterrent to predators who learned to avoid the well-marked prey that may have sickened them previously. Although preservational bias was the probable reason why remains of this species had never been found, it was possible Carolina parakeets were a recently evolved species that colonized North America, following the end of the most recent glacial-interglacial transition. But finally, just a few years ago, the remains of a Pleistocene-age Carolina parakeet were unearthed at the Dickerson Coquina sand pit in St. Lucie County, Florida. Fossils found at this site are estimated to be somewhat younger than 730,000 years BP-430,000 years BP, proving that Carolina parakeets had a very long history in North America. St. Lucie County, Florida. The Dickerson Coquina Pit fossil site, located in this county, yielded the first known Pleistocene-age remains of a Carolina parakeet. Range map of the formerly widespread Carolina parakeet. It was doomed by overhunting and deforestation. Sand is mined from the Dickerson Coquina sand pit to replace sand lost on Hutchinson Island to erosion. Hutchinson Island is located in the same county as the sand pit. Pleistocene-age fossils have been found in the sand pit and on the sand dumped on Hutchinson Island Beach. Electron spin resonance dating determined the specimens excavated from the sand pit were above a layer dated to 730,000 years BP-430,000 years BP. The species found are consistent with this dating and were common during the late Pleistocene including giant tortoise ( Hesperostestudo crassicutata ), box turtle, snakes, sharks, rays, fish, mammoth, paleollama, tapir, horse, pampathere, dire wolf, and jaguar. No bison fossils were found. Bison didn’t colonize North America until 300,000 years ago, so the absence of this species is consistent with an estimated date of 400,000 years BP for the fossils found here. The remains of at least 24 species of birds have been excavated from these sands including a number of interesting extinct or extralimital species aside from the Carolina parakeet. (The complete list of species found is described in the paper linked below as a reference). Ornithologists have identified the remains of great auk ( Pinguinus impennis ), short-tailed albatross ( Phoebastrea albatrus ), northern gannet ( Morus bassanus ), an extinct stork ( Ciconia maltha ), and an unnamed extinct crane ( Grus sp. ). 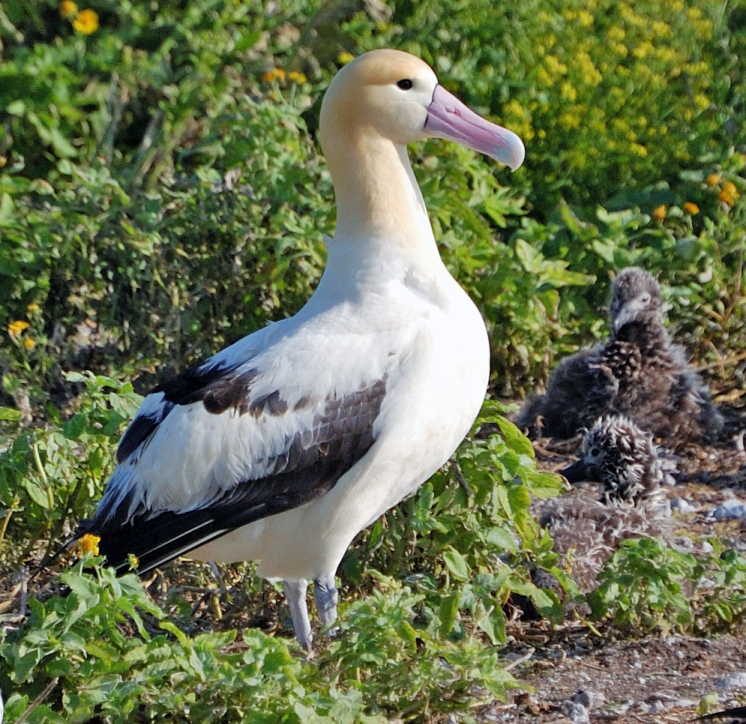 Today, the short-tailed albatross nests on just 4 islands in the North Pacific between Hawaii and Japan (including Midway near where the famous WWII battle took place). But the presence of their bones in Florida means this species formerly ranged throughout the North Atlantic Ocean. They probably nested on islands that were inundated by rising sea levels about 400,000 years ago, causing their extirpation here, but they didn’t necessarily nest in Florida. Storms may have blown flocks inland. Today, the short-tailed albatross is a rare bird that nests on 4 islands in the North Pacific, but it also lived in the Atlantic Ocean during the middle Pleistocene. The great auk was a denizen of rocky islands off the coast of Maine and Canada until 1852 when it was overhunted to extinction. I hypothesize they nested on a rocky island off the coast of South Carolina, known as Bulls Scarp, that was above sea level during Glacial Maximums. This possible nesting site may explain why they were close enough to have fished waters off the coast of Florida. It’s likely storms blew this species inland as well. 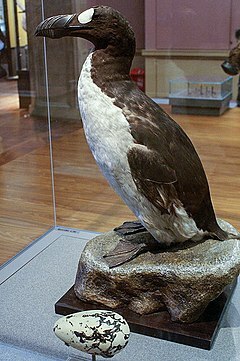 The great auk was overhunted to extinction by 1852. Remains of this species were also found at this site. I hypothesize that during Glacial Maximums this species may have nested as far south as South Carolina. Northern gannets nest on subarctic islands in the North Atlantic but range throughout most of the Atlantic when seeking fish. They too may have nested on Bulls Scarp. The extinct species of stork probably ate carrion and depended upon the existence of large herds of megafauna for a major part of its food supply. Not enough skeletal material has been found here from the large extinct species of crane to officially name it. The fossil bone recovered from the sand pit resembles that from an extinct flightless crane that formerly lived in Cuba, but it is not an exact match. This species was probably not flightless, like its Cuban cousin, because there were too many predators on the mainland. The weight of a glacier depresses the earth’s crust, a geological process known as crustal downwarping. The Laurentide Ice Sheet covered most of eastern Canada during the Last Glacial Maximum, but a sudden warm phase of climate led to the rapid recession of its southern lobe. About 13,000 years ago ocean water flooded into this glacial depression located in the present day region of eastern Quebec and Vermont, creating the Champlain Sea. The transgression of ocean water into land recently depressed by a glacier is termed eustatic sea level rise. The Champlain Sea was bordered on its northern edge by melting ice cliffs formed by the retreating glacier, while a marshy tundra existed on its south side. Over time this tundra was colonized by spruce trees. This boreal forest was in turn replaced by a landscape of mixed conifers and northern hardwoods. Meltwater and falling chunks of ice from the glacial cliffs reduced the salinity of the Champlain Sea, making it a brackish estuary teaming with a rich diversity of marine life. Map of the pre-historic Champlain Sea. It was created by crustal downwarping and fed by melting glaciers. Ocean water flooded into this basin via the St. Lawrence River. Isostatic rebound terminated the existence of this sea. Location of Levis, Quebec. An excellent fossil site is found in the St. Nicholas borough of this city, containing many species that lived in the defunct Champlain Sea. The fossil record suggests the white whale ( Delphinapterus leucas ) was the most common large mammal living in the Champlain Sea. The white whale feeds upon fish, cephalopods, and shellfish. The presence of a large population of white whales indicates an abundance of fish, and this is corroborated by the remains of both fresh and saltwater species found in deposits dating to this age here, including cod, tomcod, eelpout, capelin, smelt, spoonhead sculpin, lake cisco, lake char, wrymouth, long-nosed sucker, lumpfish, 3-spine stickleback, sturgeon, and salmon or trout. Humpback, finback, and bowhead whales, and harbor porpoises also frequented the Champlain Sea. Harp and bearded seals bred on pack ice, ringed seals bred on the shore, and harbor seals swam in the open water. Herds of walruses rested on the ice edge. Scientists have even excavated the remains of birds here–long-tailed ducks, thick billed murres, common eiders, and arctic terns. The foot bone of an old arthritic grizzly bear was found at St. Nicholas, the best fossil site in the region where the remains of many species were buried under tidal current sands. Polar bears probably roamed along the shores, but fossil evidence of their presence here has yet to be discovered. Fossil evidence suggests white whales were the most common whale species in the Champlain Sea. In 1849 geologists were surprised to find whale bones and the remains of marine invertebrates such as clams, scallops, mussels, barnacles, and sea urchin in landlocked Vermont, and it took them a while to determine a vast inland sea resulting from retreating glaciers was the explanation for the presence of these fossils. The sea existed from about 13,000 BP to ~10,000 BP. Saline levels often fluctuated, depending upon the varying quantities of meltwater, and the sea gradually became more shallow as the earth’s crust rebounded. The rise of the earth’s crust following the retreat of a glacier is known as isostatic rebound–the opposite of crustal downwarping. The sea also became warmer over time. Arctic saxicoue was an early dominant clam, but eastern soft-shelled clams, a warmer water species, replaced them. Eventually, isostatic rebound split the Champlain Sea into 2 freshwater lakes and blocked their outlets to the St. Lawrence River and Atlantic Ocean. Lake Lampsilis, named after a common species of freshwater mussel ( Lampsilis radiati ), lasted until ~8,000 years BP, when isostatic rebound completely eliminated the basin that held the lake. Today, Lake Champlain is a freshwater relic of what was formerly an enormous brackish sea. Champlain Lake is a tiny remnant of the once vast Champlain Sea. Fossil evidence suggests North American black bears evolved from an Holarctic population of bears about 3 million years ago. The founding preceding species is known as Ursus abstrusus in North America and Ursus minimus in Eurasia but they were likely the same animal. Eurasian black bears ( Ursus thibetanus ) diverged from North American black bears during some climate phase when the ancestral populations became geographically isolated. Before this divergence moderate climate allowed forested conditions to exist across the Bering land bridge. But deteriorating climate transformed the land bridge to tundra when it wasn’t submerged under the Bering Sea. Genetic evidence indicates western populations of North American black bears diverged from their eastern counterparts about 1.8 million years ago. This corresponds with the beginning of the Pleistocene. Although weak Ice Ages occurred during the preceding Pliocene, they became much more severe at the onset of the Pleistocene. Glaciers covered most of Canada and the upper elevations of the Rocky Mountains, blocking gene flow between eastern and western populations of black bears. Some mixing occurred (and is presently occurring) during interglacials, but because glacial climate phases are 5-10 times longer than most interglacials, isolation between eastern and western populations has been the norm. An ancient isolated population lives along the coast and islands of British Columbia. Glaciers covered most of British Columbia during the Last Glacial Maximum but a strip of land along the coast, including the now submerged continental shelf, hosted a temperate rain forest with a population of black bears. These forests were probably snow-covered for much of the year, an environmental condition that may have selected for white bears. The white color may also help improve success hunting for salmon. The lighter color is harder for the fish to see during the day. Today, this region is home to the highest incidence of white-coated black bears, variously known as Kermode or spirit bears. On mainland British Columbia 1 in 40 black bears have white coats, while on some of the British Columbian islands 1 in 8 have white coasts. (They are not albino.) White bears in most black bear populations are extremely rare in other regions, though when the species was more common there were occasional individuals with white coats. A white-coated bear was killed in a 1760 ring hunt (See: https://markgelbart.wordpress.com/2014/07/27/the-pennsylvania-mammal-holocaust-of-1760-a-rare-record-of-an-old-fashioned-varmint-drive/ ) Black bears may also be cinnamon, blonde, or even blue. The Kermode or Spirit bear–a white color phase of the black bear most common along the coast of British Columbia. It’s an Ice Age relic population. Blue color phase cubs of a black bear mother. Cinnamon color phase mother with black and blonde (?) phase cubs. During the Pleistocene before humans reduced black bear populations, many grew as large as grizzlies, and they had a much greater genetic diversity. However, they competed with giant short-faced bears ( Arctodus simus ) and Florida spectacled bears ( Tremarctos floridanus ). In open environments I think the former may have excluded black bears much in the same way grizzlies kept black bears from ranging into California valleys. Spectacled bears co-existed with black bears in the same forested habitats for over a million years, and the environment in many places was rich enough to support both species. Black bears were more adaptable than both of these now extinct species. I hypothesize that unlike giant short-faced bears, they learned to fear man. The ability to hibernate during cold weather also made them more widespread and successful than spectacled bears which were probably limited to regions with warmer climate. An image of a grizzly bear adorns the California state flag, although the species hasn’t been seen in the state since 1924. The irony of a state symbol that can no longer be found locally is emblematic of the environmental decline suffered nationwide because there are many place names (Panther Creek, Elk Knob, Pigeon Mountain, etc.) all across the country named after animals long absent from that particular region. Biologists believe existing wilderness in California could support a population of 600 grizzly bears, but the U.S. Fish and Wildlife Service rejects proposals to reintroduce them. Though a grizzly bear is on the California state flag, authorities refuse to allow reintroduction of the species to the state, since its extinction there circa 1924. 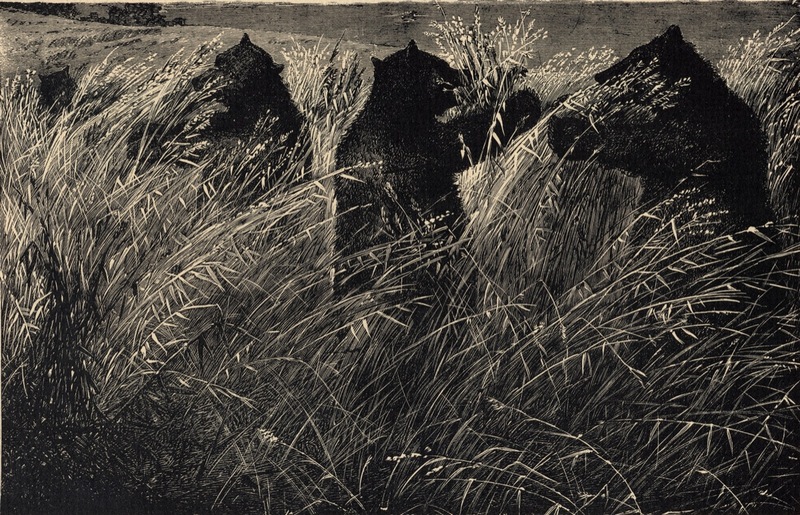 “Thieving Grizzlies in a California Wheat Field” by Albert Pennoyer. Grizzly bears, the same species as the Eurasian and Alaskan brown bear, crossed the Bering Land Bridge ~50,000 years ago. Fossil and genetic evidence suggests they colonized North America before the Last Glacial Maximum when glaciers expanded and blocked the route between what today is Alaska and the rest of the continent. Grizzly bear subfossils dating to the late Pleistocene have been found as far east as Kentucky, Ohio, Ontario, and Quebec; but the range of this species has retracted westward since the end of the Pleistocene. Grizzly bears probably roamed California for 40,000 years before their extirpation there. They did survive the end Pleistocene extinctions that terminated the existence of so many other species of megafauna. I believe they survived this extinction because unlike American species they had co-evolved with low populations of primitive humans for over a million years. This gave them time to evolve 3 adaptations that helped them survive alongside people for millennia: a) they learned to avoid people when possible, b) but females with cubs attack humans that they do come into close contact with, and c) they hibernate during severe winters when humans are more likely to take the risk of hunting a large dangerous animal because of desperation for food. When hibernating they are out of sight and more difficult to find hidden away in dens. The abundance of such a large iconic animal in California must have been reminiscent of many scenes that Paleo-Indians witnessed during the Pleistocene. Most of California provided ideal habitat for grizzly bears, and they occurred everywhere in the state with the exception of the desert. Grizzly bears like mostly open environments with some trees, while black bears ( Ursus americanus ) prefer mostly forested environments with some meadows. Grizzly bears excluded black bears from the valleys, though their ranges overlapped in the more forested mountains. 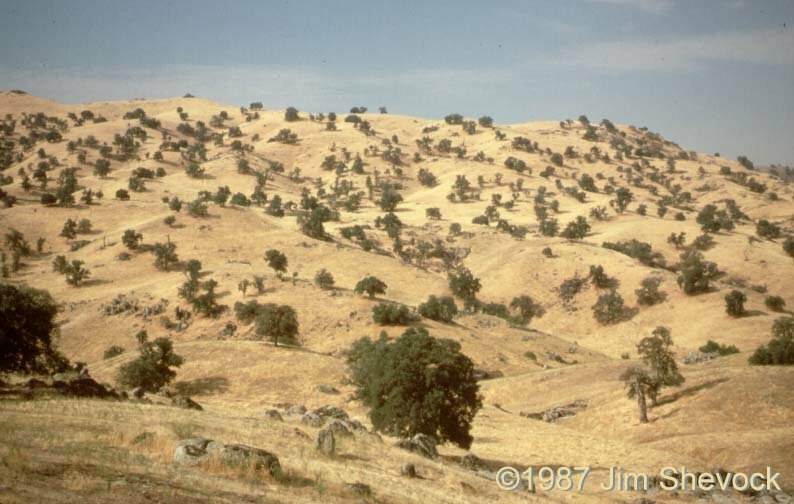 Southern California valleys and the coastal region of northern California hosted grassy oak savannahs and brush oak chaparrals where grizzlies could feast on 4 foot tall clover and acorns that fell from over 5 different species of oak. Along the coast they scavenged beached whales and other marine life. 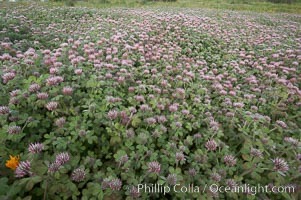 Large meadows of 4 foot clover (Trifolium sp.) were an important food source for California grizzlies. Blue oak savannah in California. Grizzlies loved to forage for grass and acorns in this environment. 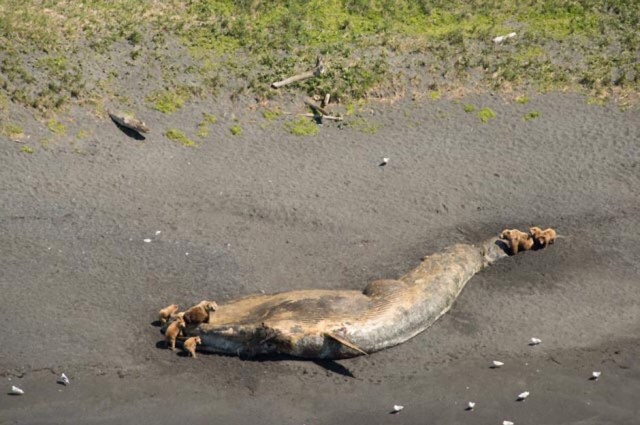 Beached whales and other marine life were an important source of food for California grizzly bears. Here is a passage from the below referenced book that gives an account of how common grizzly bears were during European colonization of the region. One county of California-San Luis Obispo– was known as the “Valley of the Bears.” Bear jerky from bears killed in this valley saved the first Spanish settlement in California at Monterey Bay when the settlers were in danger of starvation in 1770. Grizzly populations temporarily increased in California from 1800-1860, thanks to the large Mexican ranches and their enormous herds of livestock. Grizzlies directly hunted some and scavenged others that suffered natural deaths. Grizzlies often lured curious cattle to them by lying on their backs with their paws waving in the air. They pounced on cows venturing too close. During droughts ranchers shot large numbers of cattle, horses, and sheep to prevent overgrazing, and grizzlies exploited this additional source of easy protein. (Severe droughts strike California every decade. These droughts are likely unrelated to anthropogenic global warming.) The bears also foraged butchering grounds. The Mexican ranchers didn’t always have good quality firearms, so they killed grizzlies with lassoes. A group of men on horseback would lasso the bear and drag, strangle, or stress the animal to death. It took great skill for both man and horse to lasso a grizzly, and it was very dangerous. A grizzly might shake loose and charge. In some cases a grizzly would seize the rope and pull the horse and rider toward it paw over paw. If the rope was tied to the bridle, this could be disastrous for the horse and man. Rancheros lassoing a grizzly bear. The early Spanish settlers in California often didn’t have good rifles, so they lassoed grizzlies, dragging or strangling them to death. This took great skill but was extremely cruel. Staged fights between bears and bulls were a popular “sport” in California during the 19th century. Every major town had a bear-bull fight on every holiday. The bear and bull were attached to each other with a 20 yard long leather strap, and they fought until 1 or both suffered fatal injuries. The Mexican ranchers captured powerful large bears, so when Mexico owned California the bears usually won these cruel contests. But when the U.S. gained control of the state, most of the bears supplied for these contests were small individuals captured in traps by miners, and the bulls usually won. In 1 contest a bear was pitted against a cougar. Surprisingly, the much smaller cat killed the bear. A majority of Americans rejected this Spanish/Mexican custom, and local governments began passing ordinances against these spectacles, but they didn’t completely stop until grizzlies were extirpated here. Between 1850-1890 the population of humans in California increased from 92,597 to 1,213,390. This doomed California grizzlies. Americans brought superior firearms capable of more efficient killing, and there were just too many conflicts between people and grizzlies. The valleys where grizzlies thrived were also prime agricultural lands. 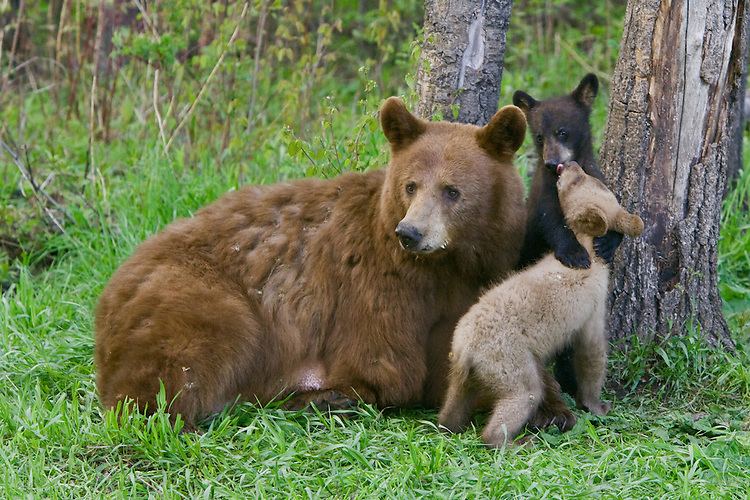 Farmers and ranchers would not tolerate grizzlies eating their crops and livestock. City people did not want grizzlies busting into their homes to consume the contents of their cupboards. Miners were afraid of getting mauled when they carried their pouches of gold dust to the nearest bar or brothel. California grizzlies were ruthlessly hunted until about 1924 when there were none left in the state. Scull Shoals is a ghost town located in Greene County, Georgia adjacent to the Oconee River. People have lived at this site off and on for at least 8000 years and probably longer. Archaeologists have excavated Indian artifacts, including broken pottery pieces and arrowheads, representative of the Archaic, Woodland, and Mississippian Cultures. After the Revolutionary War the U.S. government granted this land to war veterans. The Cherokee Indians were not too happy to have their land granted to Europeans, so they attacked the first settlements in 1788 or 1789. In response the settlers built Fort Clark here in 1793, and the Cherokees were eventually driven away from their homeland. What Scull Shoals looked like during the 19th century. Note the barren almost treeless landscape. It was surrounded by cotton and corn fields that were muddy moonscapes during winter. The settlement was named for the beautiful rocky shoals in this part of the Oconee River. These shoals are no longer visible because eroded soil has covered them deep under sediment. The entire site was a magnificent virgin forest until European settlers ruined it. First, they built saw and paper mills, hydropowered by mill races they constructed. After they cleared all the trees, they planted row crops of cotton, corn, and wheat to be processed in flour mills, also hydropowered. During summer corn and cotton fields extended from horizon to horizon but winter landscapes consisted of mud as far as the eye could see. Short-sighted agricultural practices led to complete erosion of the topsoil into the river, covering the shoals. Alternating floods, droughts, and recessions destroyed the economy of the village. Floods spoiled the grain and cotton waiting to be milled. Droughts caused low water when the mills couldn’t be hydropowered and were thus idled. By 1930 the town was abandoned. Land speculators sold the site to the federal government in 1959, and it became part of the Oconee National Forest. Today, a mixed forest of 2nd growth oak and pine surround the site. Water oak, sycamore, and sweet gum dominate the actual site of the town, and there is an undergrowth of bamboo cane. Some of the trees are quite large and may be over 80 years old. Ecologists believe it takes 1000 years to build 1 inch of topsoil. The original topsoil was 12 inches thick, so it will take 12,000 years of reforestation before the topsoil is as rich as it was in the 18th century. We saw an armadillo when we visited Skull Shoals. The population of armadillos now outnumbers people here. The kiosk in front of the old site of Scull Shoals. This bridge spans the millrace. Due to the drought, there is no water in the millrace. Droughts contributed to the decline of Scull Shoals because they couldn’t run the mills without water powering them. During times of normal water flow this millrace is filled with running water. Note how low the Oconee River is. The beautiful shoals that inspired the name of the town have been covered by eroded soil and are no longer visible. Big sycamore trunk. The federal government bought the site in 1959 and added it to the Oconee National forest. Scull Shoals is now a nice picnic area. Dominant trees consist of water oak, sycamore, and sweetgum. Armadillos outnumber people as permanent residents of Scull Shoals today. Strange. Cryptic. Uncommon. Unique. These are all words that could be used to describe the star-nosed mole. The alien-looking structure on the end of its nose is known as an Eimer’s organ. All 30 species of moles have this organ, but none have one that is as developed as the star-nosed mole’s. The Eimer’s organ is used to detect prey in underground darkness and water, but scientists aren’t sure how it works. Some think it senses tacticle stimulation, while others believe it senses the electrical fields of prey. It may sense both. In any case over half of a star-nosed mole’s brain is used to process information gathered by its Eimer’s organ. The star-nosed mole is a semi-aquatic subterranean mammal, living in meadows and woods adjacent to streams, ponds, and marshes. They also occasionally occur in drier habitats. Their underground tunnels often lead to water. Incredibly, they can smell underwater by blowing a bubble that sticks to the end of their nose. They are the fastest feeder on the planet, able to detect and consume prey in .2 seconds. Scientists believe they evolved this rapid feeding mechanism and well developed Eimer’s organ to help them survive wet muddy environments where there is a dense population of small insects. Star-nosed moles feed upon insects, worms, mussels, snails, crustaceans, salamanders, frogs, and fish. Range map for the star-nosed mole. This map doesn’t include Richmond, County Georgia where I reside. Star-nosed moles do occur in east central Georgia. My cat killed a specimen and left it on my back porch about 10 years ago. They likely have a more extensive range than this map indicates but are rare and haven’t been reported in many areas of their range. As far as I know, I am the only person to report the presence of star-nosed moles in Richmond County, Georgia. According to the scientific literature and accepted range maps, star-nosed moles don’t occur in east central Georgia. But about 10 years ago, a cat killed a star-nosed mole in my back yard. My lot is on a sandhill plateau approximately 1/2 mile from a creek and wetland. All other cat-killed moles in my yard were the much more common eastern mole ( Scalopus aquaticus ). There is no chance of misidentification–the star nose is obvious. Star-nosed moles may have been more widespread in southeastern North America during cool Ice Ages. Over half of their present day range was under glacial ice then, and their range shifted south. Pleistocene-aged remains of star-nosed moles have been excavated from caves in Arkansas and Missouri–far outside their present day range. Cool moist stages of climate with low evapotranspiration rates supported more boggy environments favored by star-nosed moles. However, it’s possible star-nosed moles still occur in those states but exist in cryptic populations yet to be discovered (or recognized and reported) because it is an uncommon animal that lives underground and is not often seen. Video about the star-nosed mole. You are currently browsing the GeorgiaBeforePeople blog archives for December, 2016.